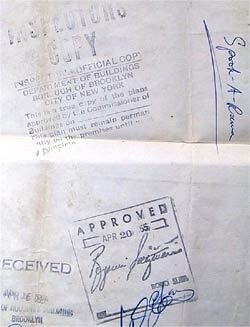 to this day is a Coney Island institution. 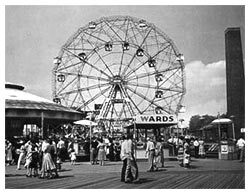 Upon the death of his father in 1935, Fred Garms took over the operation of the Wonder Wheel, and in the early fifties became interested in opening a dark ride on a strip of property adjacent to the wheel. Dark rides were a common fixture among the amusements of Coney, and Fred, like his father, wanted to build a ride that would stand above and beyond all of the competition. Thus was born Spook-A-Rama, which opened for the season of 1955. What's in a name? The name of Spook-A-Rama was likely a take-off of Cinerama, the giant-screen motion picture process which was at the height of its popularity when Spook-A-Rama opened. The Cinerama movie's opening sequence was a ride on the Atom Smasher roller coaster at the old Rockaway's Playland in Queens, NY. Coincidentally, some stunts presently operating in Spook-A-Rama came from Rockaway's Hell 'N Back dark ride. Spook-A-Rama's layout was originally drawn up to occupy a long strip along Jones Walk from the Bowery intersection to a point just beyond the Wonder Wheel where the actual dark ride interior building was to be situated. Before and after reaching this building, a long expanse of track was planned to run in an outside area (the courtyard) almost down to the Bowery corner where onloading and offloading were to be performed. Original blueprint of initial Spook-A-Rama exterior ride layout. But the plan as drawn on the blueprints would prove to be insufficient for Garms' grand vision, and another interior building was added. This building (Building #1), at the Bowery end of the layout, was the primary point of departure for the ride. Beginning their journey, riders would pass beneath a curved, clear plastic canopy over which colored water flowed simulating a waterfall before entering this first building. 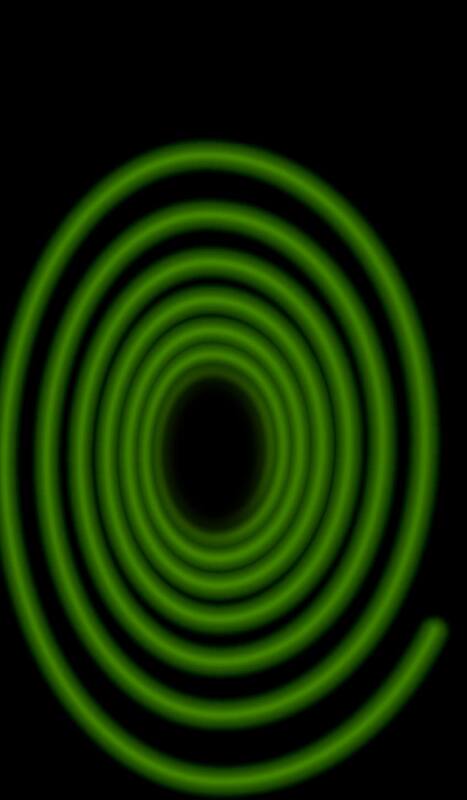 Inside was simply darkness with the requisite 'spider web' threads dangling. The cars would almost immediately make a sharp U-turn and quickly emerge into the courtyard and begin their open-air travel, passing the back side of one of the large brick buildings which had been part of the former Feltman's Beer Garden complex, and upon which was painted a huge, garish sign beckoning passers-by to ride Spook-A-Rama. The cars would proceed along the constantly oscillating track, past a few sinister figures housed in weather-resistant plexiglass, before arriving at the main building (Building #2), where the ride would commence in earnest. For the rolling stock and trackage, Garms contracted William Cassidy's Pretzel Amusement Ride Co. of Bridgeton, NJ. No stranger to Coney Island, having installed in excess of twenty rides there, Cassidy was taken aback by Garms' intention to lay a quarter-mile length of track with some three-dozen cars, an amount essentially equalling at least four standard ride installations. Yet, on Garms' insistence, this is what came to be, and Spook-A-Rama's elaborate signage proclaimed with classic Coney Island ballyhoo: "The World's Longest Spook Ride"; "The World's Longest (Level) Ride" (so qualified to differentiate it from roller coasters which would commonly have longer track); and "More than One Quarter-Mile Long!". Pretzel furnished their elegant and innovative rotating cars, which had been introduced a couple of years earlier.The cars had luxuriously upholstered high-backed seats and would rotate in both clockwise and counter-clockwise directions as they moved along their twisted path. But Garms would quickly abandon the cars' rotating function, possibly to reduce the dizziness that it induced, but just as probably to ensure that riders were facing in the right direction to see and hear each elaborate stunt as it was activated. 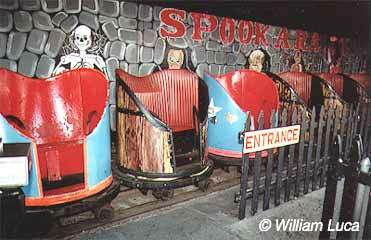 Shown above: The current lineup of Spook-A-Rama cars. 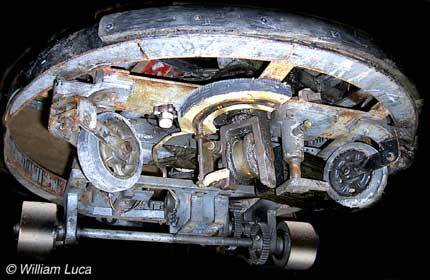 Left: Undercarriage of Pretzel rotating car at Spook-A-Rama.